Nick and I used to feel ambivalent about Veteran’s Day. It wasn’t an issue with the holiday itself. We just felt ambivalent about his entire involvement with the military. Nick joined when we were both twenty years old and still in college. He earned a good salary for doing nothing but what he loved to do–which was go to school. His job after school would be teaching, which was his goal at the time. Go to school to be a teacher. The fact that he would be teaching for the Navy at a Navy school didn’t make much difference to him, because he knew he needed experience to see if he was good at teaching and if he wanted to do it for the rest of his life. After Nick graduated from the University of Dallas with his BS in Math, we moved to Charleston. He taught at the Nuclear Power School, and we both started our MA degrees at the College of Charleston. His was paid for by the Navy. We bought a tiny house that was financed by the Veteran’s Administration. Every man and woman who works in the engine room of a Navy carrier or submarine started at the Nuclear Power School. They endure a high-paced, physically and emotionally demanding year-long program of math, physics and chemistry along with healthy doses of mechanical, electrical and nuclear engineering. Nick learned a lot, to put it mildly. He sometimes chafed against military strictures and schedules, but he loved his students. He worked hard for them, and they loved him for it. After Nick finished his active duty requirement, we were still ambivalent. But he didn’t want to leave it behind completely. We had this idea that if he could have a career in the reserves, he would get a healthy retirement package and we would never have to pay more than a few thousand dollars a year in health insurance, no matter how many kids we had. And that’s true. Retirement is important. And goodness knows health insurance is important. But I think more than that, the Navy had started to be a part of his identity. So after his four years of teaching, Nick decided to sign up with the Naval Reserves. We moved to Boston, and each of us started a PhD program. The GI Bill, a veteran’s education benefit, has supplemented our meager graduate student incomes for three years, and we will continue to receive it for two more years. Nick started to do his reserve work in Newport, RI. He helped different people with research projects that (felicitously) were similar to what he studies in his PhD program. Then he got deployed to Afghanistan. To make a long story short, it was kind of a mistake. No names named, but it didn’t have to happen. We were mad. We were sad. We had just been planning our second adoption, and I was just starting to get good work done in my program. But in the midst of the drama, Nick was kind of happy about all of it. He felt validated, like now he was REALLY in the military, and really deserved all these amazing benefits we’ve been given. Then there was the year he was gone. It was terrible, long, lonely and stressful for both of us. But something changed about our ambivalence to the military. Suddenly, it was clear that the work he was doing was good. He was Officer in Charge of Strength Management in Kabul, responsible for personnel accountability of over 100,000 people. He developed a desperately-needed software program and reporting procedures to enable the force reduction that we’ve heard so much about in the past year. He did good work. He came home. Now, when people thank him for his service, he doesn’t look at his shoes and mumble a response. He doesn’t feel guilty because they don’t know he’s never been deployed. Now, he feels like he deserves the praise. And he does. When Nick was gone, I took a year off of work. I just couldn’t do much because we decided that if Nick was going to disappear from our son’s life, we couldn’t just put him in daycare or get a full time nanny. He couldn’t have everything change at once. I had to explain my decision to several people in my program, and it was awkward at times. Most people understood and were supportive, but I raised some eyebrows. That would be an easy way to explain it. And on at least one occasion, I let the comment speak for itself, thereby presenting Nick and myself as once-young, gullible children who thought the military sounded nice because they give a “free” ride. But it wasn’t that at all. I can’t say the military is all bad, and I can’t say everyone in the military is bad except for the young men and women who get suckered into serving. First of all, Nick didn’t get a free ride from the military. He already had a free ride to college. He got a salary from them. Secondly, we weren’t suckered into it. Nick wanted to teach. They paid him much more than he would have made as a teaching assistant in his masters program. Thirdly, despite the bad things that the military sometimes does, despite their colossal disorganization and the way they waste money, despite the fact that recruiting often isn’t in the best interest of the young people who are recruited, it’s not all bad. Like almost any organization, it is filled with fallible, not-so-good people. It is also filled with good people who want to do the right thing. And the not-so-good people and the good people are often the same people. Because that’s how human beings are. I’m not a military supporter, per say. I lean toward pacifism. But what I’m not ambivalent about anymore is Nick being in the Navy. 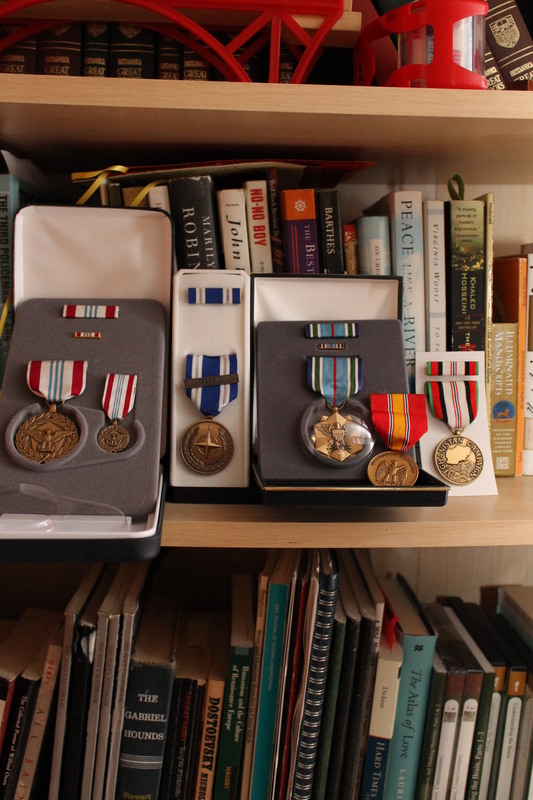 Last week, I took out all Nick’s medals from his Afghan duffel bag. I put them in a row on the shelf in our living room. And I cried. Not just because it’s been a hard year. Not just because the transition to normal life is hard. 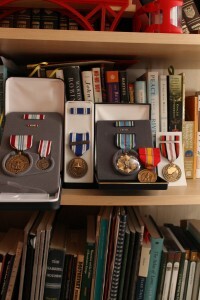 But because the medals, which used to be just objects of propaganda in my eyes, now have a rich and personal history.